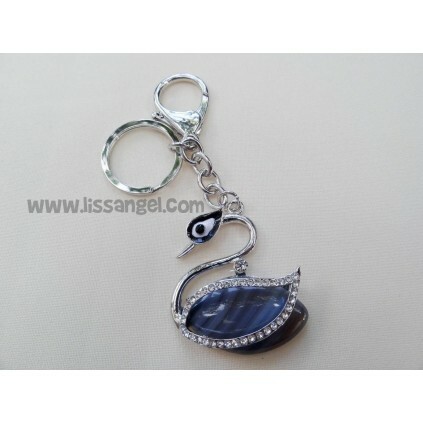 Pretty keychain in the shape of an elegant swan. The wing has full of bright stones, and the body of the swan is a natural stone that has different shades depending on the light. The color of the stone is a choice of two colors, blue or brown. The keys to your house now beautiful than ever with this keyring inspired by swans. We send them wrapped in beautiful boxes, so they are perfect for make a nice gift. Swan size, without chain and hooks: 4.5cm x 4cm wide high. Total height with chain and hooks: 12cm approx. The animals are sources of inspiration for all kinds of products, and keychains are too. In our collection of animal keychains, you can find a lot of pretty keyrings with the funniest animals. Gather beauty and practicality with these cute animal clock keyrings. There are three models to choose from: with dolphins, butterflies or turtles. Which one do you like the most? 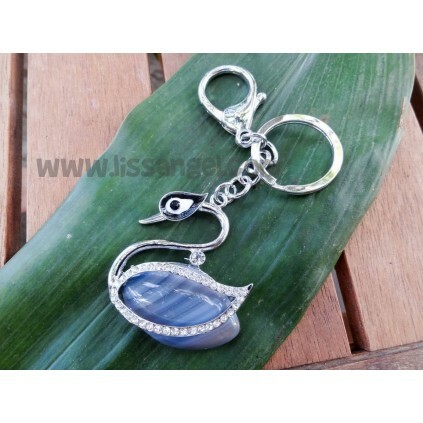 Shiny keyring made of synthetic leather with patent leather finish. It has the shape of a Scottie or Westie dog breed. Elegance made keychain. With this cute owl-shaped keyring, you'll have your keys handy at all times with a nice design. Can be a keyring more functional than this? With this elephant shaped keyring you will have funny moments listening an elephant while you light with its trunk that have a powerful integrated LED. Butterfly-shaped keyring, made of soft felt and soft padding. It has metal washer and a separate snap closure type. Colors to choose from (brown, purple and green). With this original keyring shaped like a chinese lucky cat, which is a real and functional clock, you will bring luck and fortune wherever you take it. Pretty Owl shaped keyrings, made of soft synthetic leather and stuffed with soft padding. The most original and fun way to carry your keys. Soft, beautiful cat shaped keyring, made of soft synthetic leather and filled with padding. The most Kawaii animal inspiration comes now to our keyrings section. These beautiful animal keyrings are waiting to adorn your keys. A tiger, an elephant and a sloth. Sold by unit. Which one do you like most? Original animal key rings made in resistant resin, vintage style. Four models to choose from (cat, dog, bear and elephant). Are you a fan of French bulldog? So go ahead and get this nice and super detailed keyring made of resin in the shape of a cute French Bulldog. Do you have a Westy dog or you like them? We present this keyring made of resin with a super detailed form of a Westie dog breed. Yes, they are monkeys, and also musicians :) Decorate your boring bunch of keys with these keyrings shaped monkey, playing instruments. Lovely farm sheeps are ideal for giving a funny touch to your keys. Soft plastic sheep-shaped keyrings. Two models to choose from.